Our long-term collaboration with Oxford University is supporting the investment into new facilities to maintain its position as a world-leading educational institution. This work is part of our focus across the whole education sector which will enhance learning experiences for future generations. We are currently involved in several projects for the University’s colleges and teaching departments. New buildings at Mansfield, The Queen’s, Keble, and St. Peter’s Colleges and the Physics Department are all currently on site. The Investcorp Building at St. Antony’s College was inaugurated in 2015. 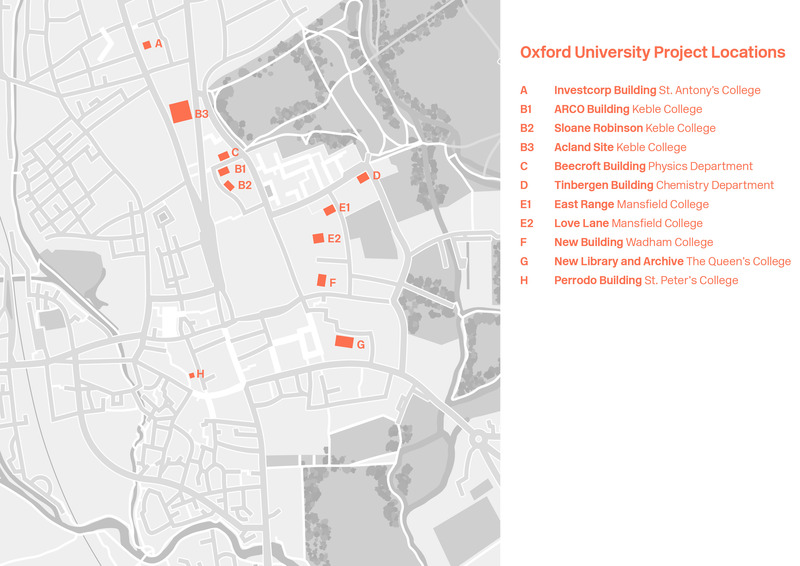 We are soon to begin work for new commissions at Wadham College and the Tinbergen Building at the Chemistry Department. Love Lane Development, Mansfield College, and the New Library, The Queen’s College, are near completion and are expected to be unveiled for the new academic year in Autumn 2017. 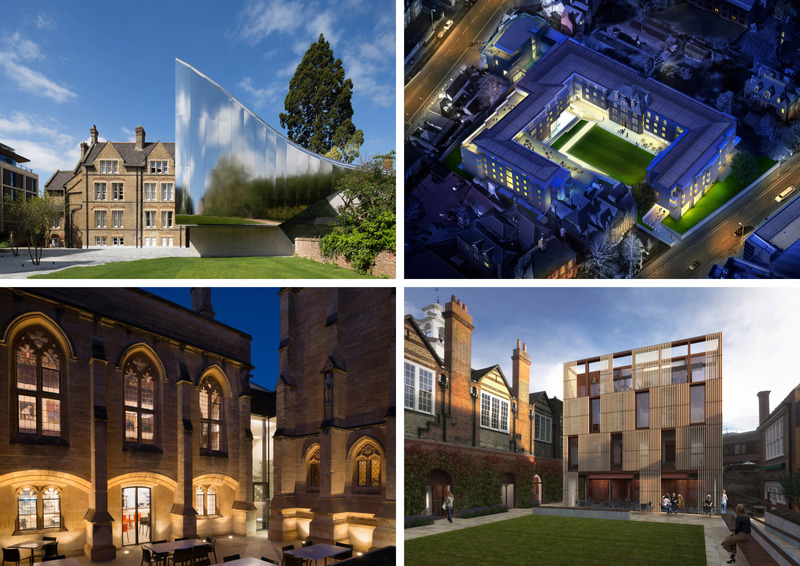 Both projects are in collaboration with long-term collaborators Rick Mather Architects, with whom our Oxford work dates back to the ARCO (1995) and Sloane Robinson (2002) Buildings at Keble College through Brian Eckersley, our Senior Director. Love Lane Development will provide 76 new student accommodation rooms and an internationally recognised Human Rights Institute on two lower basement levels. 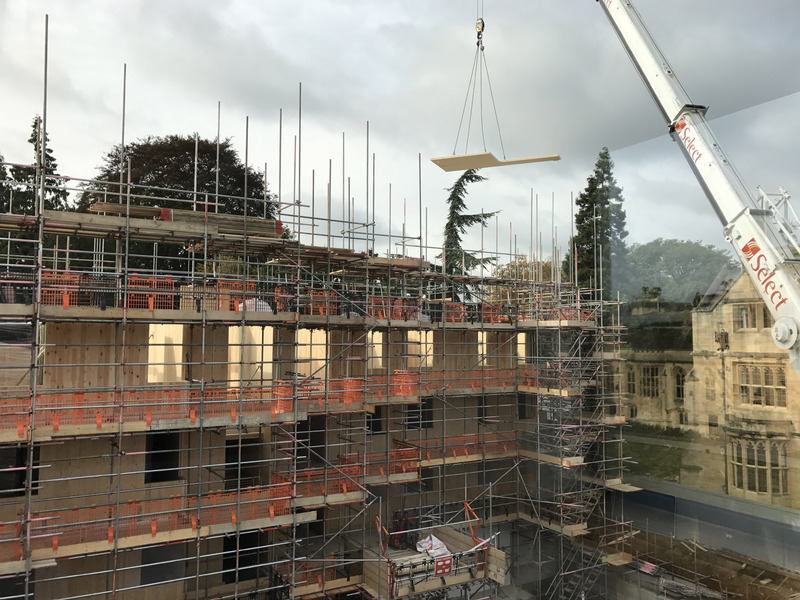 Five floors of en-suite student residential units have been built from Cross Laminated Timber (CLT), one of the first in this prefabricated form of construction in Oxford – an approach which has reduced time on site. Using timber for this project is estimated to save 57% in carbon emissions compared to constructing the building entirely in concrete. 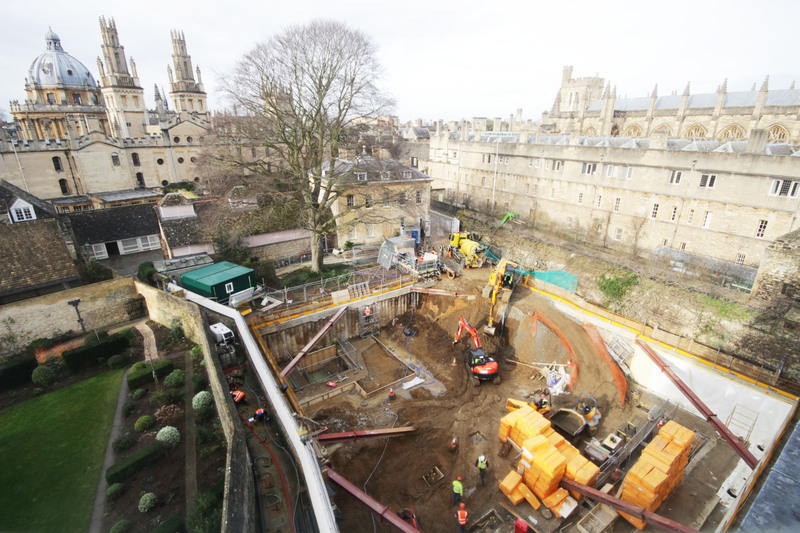 The New Library at The Queen’s College is in a new basement formed in particularly sensitive surroundings, immediately adjacent to and below the existing Grade 1 listed Library, and with fragile historic walls on either side. Challenges have included minimising the impact on the adjacent structures and making the complex connection with the existing library, which has required underpinning to the medieval wall. Keble College’s Acland Building broke ground on site in October 2016. Also with Rick Mather Architects, the building will provide some 250 student bedrooms, semi- public and communal spaces on the ground floor include a café, seminar rooms and library. The oldest part of the original Acland Hospital, a listed building, is retained and re-supported on a new basement structure which runs under all the buildings and contains a lecture theatre, gym and storage. The Perrodo Project at St. Peter’s College, with Design Engine, will provide study bedrooms with tutorial and seminar space above and below, plus remodelled existing listed accommodation to create flexible teaching and lecture space.